Why do Carriers Still Ignore Wildfire? Wildfire has been big news in 2015. The USA and Canada are both having epic years, as long-term droughts combine with hotter and drier-than-normal temperatures in much of the West burning more acres and buildings than ever. Yet, when I talk to carriers about risk analytics, wildfire seems like an ignored peril. Why? Historically, wildfire has been underwritten (or excluded) based on proximity to trees. Historically, that was adequate, too. But over the past 20 years, as towns and suburbs have expanded into wildland, the exposure to losses has increased exponentially. This week, AM Best (mind the subscription-wall) is reporting on Guy Carpenter’s estimated losses for the Western US in 2015 and the figures are eye-catching: $1.75 billion. 2014 was a relatively quiet year for cat losses, specifically flood. But it is clear that this year’s losses are comparable to the well known catastrophes. $1.75B in insured losses is impossible to ignore, and there is no reason to ignore it. The 2015 losses have been all over the west, from dozens of fires in Texas, to Washington’s most costly wildfire ever (in the Okanogan Valley), to California’s massive Valley and Butte fires. They have burnt small towns, vacation-areas and suburbs in coniferous, scrubby and deciduous woodlands. The fact of the matter is that underwriters can improve their wildfire underwriting right now. The data and analytics exist and are available to underwrite wildfire with more confidence than wind or convective storm. 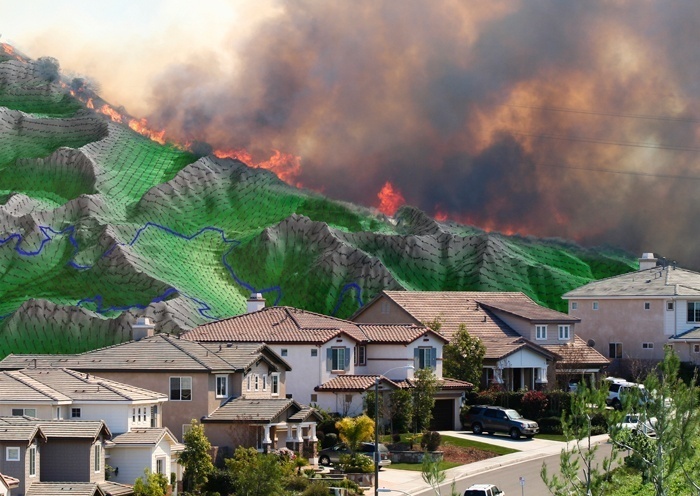 The No-HARM wildfire model from Anchor Point identifies homes at risk of fire from a burning forest AND from flying embers. Both the chance of a wildfire happening and the intensity if it does are modeled. Anchor Point, based in Boulder, Colo., has compared their model with the larger fires this year in Washington and California, and the model has performed extremely well. There is no reason for underwriters to ignore wildfire any more. Everything they need to understand the risk is available and ready for them. Looking for more information on model validation using 2015 wildfires? Leave your question and/or comment below and I'll get back with you.